The Forum of Private Business is a not for profit membership organisation that reinvests its profits into improving the products and services for members. The Forums Hall of Shame highlights questionable behaviour, as well as late payment practices usually involving larger companies and this, has led to us looking at the area of ethical behaviour within businesses. Our members and we ourselves embed ethical standards of operation within our businesses and we want you to do the same. Our members who are a majority of small business employers are closer to their own workforce, suppliers and the communities that they work within than many of the UK's larger organisations and multinationals, who frequently seem quite happy to work just within the law or occasionally outside of it. This unprincipled corporate behaviour leads to more regulation and red tape which affects all levels of business and has more of a detrimental effect on the smaller businesses who do not have the same resources to deal with it. So, whilst lobbying Government bodies about this and pointing out the inequalities in the system, we also feel it is important to encourage our members and others to maintain their own ethical stance. 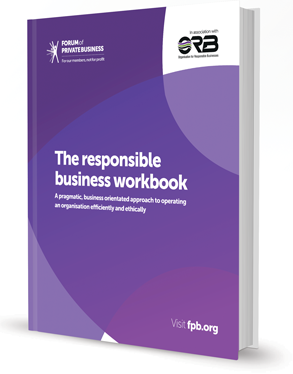 With this in mind, the Forum of Private Business teamed up with Organisation for Responsible Businesses to provide the Responsible Business Workbook. This workbook covers the requirements of The Responsible Business Standard which has been developed by The Organisation for Responsible Businesses and validated by Anglia Ruskin University. This quality system has been designed specifically for small businesses, franchisors and other organisations such as social enterprises and charities that wish to demonstrate good social and environmental practice, maintained and enhanced within a solid business foundation. As a member of the Forum you can take the opportunity to undertake a full audit and achieve Responsible Business Standard certification, but even if you feel your business would not benefit from an audit we are confident that you will find the guide an invaluable toolkit. Certification is valid for 2 years from the date of issue. 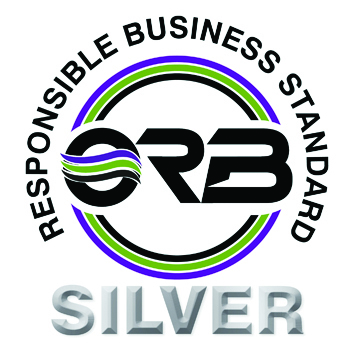 The Forum of Private Business is proud to have been awarded a Silver certification.